At 38-weeks gestation a 31-year-old primigravida presented with diplopia on left gaze of 1- day duration. The diplopia was worse for far objects. She had unilateral throbbing headache similar to her previous migraines for 3 days prior to admission, associated with two to three episodes of vomitting per day, which were similar to her previous migraine attacks. There was no history of fever, photophobia or phonophobia. She had an uneventful follow-up in antenatal clinic throughout the pregnancy. Her blood pressure was normal at the 13 week, 20 week and 33 week follow up visits. Her urinalysis was normal and she was not diabetic. There was no significant past medical or family history. She was non-smoker, non-alcoholic and there was no history of substance abuse. Preeclampsia was ruled out and she was referred to neurology with above history on the same day of admission. On examination, she was alert and oriented. Her blood pressure was 106/65. There was complete paralysis of the left lateral rectus muscle. She had hyper-reflexia in all four limbs (Deep tendon reflexes were 3+). Rest of the neurologic examination was normal. 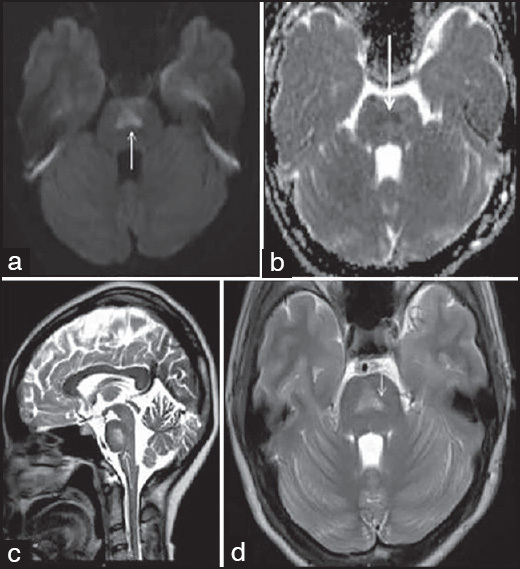 MRI brain showed a non-enhancing, central, symmetrical, pontine T2 hyper-intensity which also showed evidence of restricted diffusion [Figure 1]a and b consistent with central pontine myelinolysis (CPM). The MRI of orbits, MR angiogram and MR venogram were unremarkable. Blood investigations including full blood count, ESR, renal, liver and thyroid function tests, folate, Vitamin B12, calcium and phosphate were normal. Serial daily electrolytes did not reveal any derangement. Toxicology and autoimmune workup included were negative. Lumbar puncture opening pressure was normal and CSF was unremarkable. (WBC = 0; Proteins = 0.24g/; Glucose normal; Gram stain, bacterial culture, fungal smear and culture, TB-PCR and TB-culture negative, oligoclonal bands negative). There are two attributes of our case which make it unique. First is the occurrence of CPM in third trimester of pregnancy in the absence of any identifiable secondary cause and second is the presentation of CPM with an isolated VI nerve palsy. In pregnancy, central pontine myelinolysis is seen in the first trimester, in the context of hyperemesis gravidarum. The rapid fluctuations in blood osmolality due to acute hyponatremia and/or its rapid correction are commonly implicated factors. In pregnancy, hypokalemia and thiamine deficiency  (also associated with hyperemesis in first trimester), salt restricted diet  and lithium toxicity in 2nd trimester,  gestational diabetes in third trimester,  and magnesium sulfate in immediate postpartum period  have been associated with pregnancy-related CPM. However, all these patients had hyponatremia (except one who had hypokalemia) of variable severity secondary to the underlying conditions described. Our case is unique in the sense that she did not have any identifiable secondary cause. To our knowledge, our case is the first description of CPM in third trimester of pregnancy in the absence of secondary causes. Our patient's sodium level on admission was normal and it remained normal throughout the week of her admission. Whether pregnancy itself makes brain susceptible to myelinolysis due to minor osmotic imbalances is a hypothesis arising out of our observation. In our patient, vomiting, although mild, could have been the minor trigger responsible. CPM has a broad clinical spectrum with asymptomatic cases  at one end and florid cases with quadriparesis, locked-in state and coma  at the other end of spectrum. Presentation of CPM as isolated VI nerve palsy is unusual and not reported earlier to our knowledge. In our patient, the MRI lesion does correlate anatomically to the location of VI nerve fascicle. After its origin at VI nerve nucleus in pons, the VI nerve fascicle passes anteriorly through the substance of pons. In our case, the left posterior angle of the central pontine triangular lesion was perhaps the site where the fascicle was involved [[Figure 1]d arrow]. This location is just posterior to the pyramidal tract and anterior to the medial lemniscus. These two structures were spared clinically. With the pontine lesion, and temporal relation of clinical recovery to radiologic resolution, it is hard to attribute the VI nerve palsy to other causes than the pontine lesion itself. Cases of pre-eclampsia and hypertension presenting as VI nerve palsy in pregnancy have been described. But these patients did not have CPM like brain lesions and our patient did not have any evidence of pre-eclampsia or hypertension. There were no signs of raised ICP in our patient. Also, the MRI did not show any evidence of edema in the extrapontine region to explain raised ICP as the cause. In our patient, one might argue for other causes of transient pontine edema resulting from conditions like posterior reversible encephalopathy syndrome (PRES). However, our patient had no risk factors for the same and the MRI did not show even subtle changes suggestive of PRES. 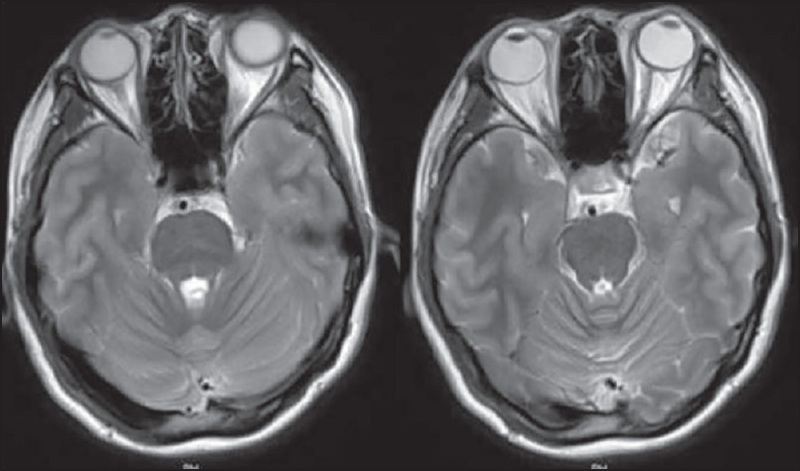 MRI differentials for central pontine lesions described in our patient include infarct, metastasis, glioma, multiple sclerosis, encephalitis, and radiation or chemotherapy-induced changes. Thus, such changes are not specific to CPM. The benign clinical course and complete resolution of MRI changes in short span of 2 weeks without any specific treatment makes alternative diagnoses unlikely in our case. Occurrence of CPM in third trimester of pregnancy without obvious secondary causes and spontaneous resolution after delivery makes us postulate as to whether pregnancy itself, due to its hormones predisposes to this condition. Isolated VI nerve palsy could be another presenting manifestation of central pontine myelinolysis. Castillo RA, Ray RA, Yaghmai F. Central pontine myelinolysis and pregnancy. Obstet Gynecol 1989;73:459-61. Bergin PS, Harvey P. Wernicke′s encephalopathy and central pontine myelinolysis associated with hyperemesis gravidarum. BMJ 1992;305:517-8. Ioannidis P, Balamoutsos G, Karacostas D. Salt-free diet and pregnancy-related central pontinemyelinolysis: "To diet or not?". J Neurol 2010;257:2101-2. Bejot Y, Depierre P, Osseby GV, Troisgros O, Moreau T, Giroud M. Central pontine and extra-pontine myelinolysis: A complication of lithium toxicity in a pregnant woman. Clin Neurol Neurosurg 2008;110:852-4. Lee IW, Su MT, Kuo PL, Chang CM. Gestational diabetes and central pontine myelinolysis with quadriplegia: A case report. J Matern Fetal Neonatal Med 2010;23:728-31. Riggs JE, Hogg JP. Central pontine myelinolysis: Association with parenteral magnesium administration. Mil Med 2000;165:494-5. Shah SO, Wang A, Mudambi L, Ghuznavi N, Fekete R. Asymptomatic central pontine myelinolysis: A case report. Case Rep Neurol 2012;4:167-72. Vallejo-Vaz AJ, Stiefel P, Alfaro V, Miranda ML. Isolated abducens nerve palsy in preeclampsia and hypertension in pregnancy. Hypertens Res 2013;36:834-5. Miller GM, Baker HL Jr, Okazaki H, Whisnant JP. Central pontine myelinolysis and its imitators: MR findings. Radiology 1988;168:795-802.